Start your pedicab tour just a few blocks south of Central Park, a celebrated urban oasis that sits in the center of Manhattan. 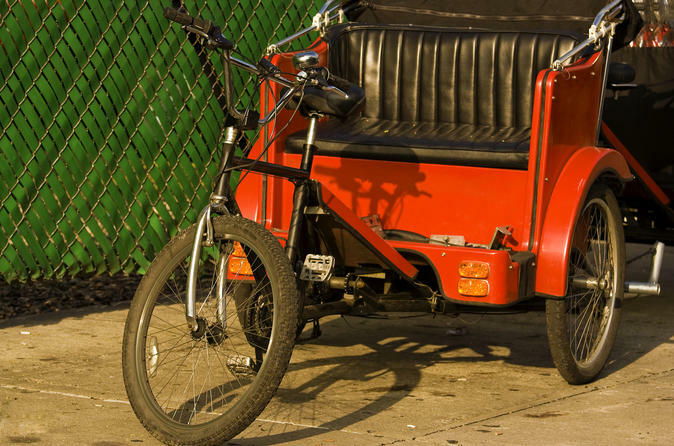 The pedicab’s canopied seating compartment is attached to a large tricycle that your professional guide pedals throughout your 1-hour or 2-hour tour, so all you have to do is take a seat and you’re on your way! Opened in 1857, Central Park covers a sprawling 843 acres (341 hectares) and draws thousands of locals and tourists every day. Your guide will tell you interesting facts and figures about this magnificent New York gem and point out major landmarks including Central Park Carousel, The Dairy, Literary Walk, Sheep Meadow, Tavern on the Green and Strawberry Fields. The picturesque park has been the setting for scenes from numerous movies over the years. You will see some notable filming locations including Naumberg Bandshell from Breakfast at Tiffany’s and Wollman Rink from Serendipity. Stop along the way to stretch your legs and capture photos of famous attractions. Don't be surprised if you find people taking pictures of you, too, as you whiz by in your quirky little pedicab! After exploring the park, you’ll return to your Midtown Manhattan departure point, just a block from the high-end shops of Fifth Avenue.